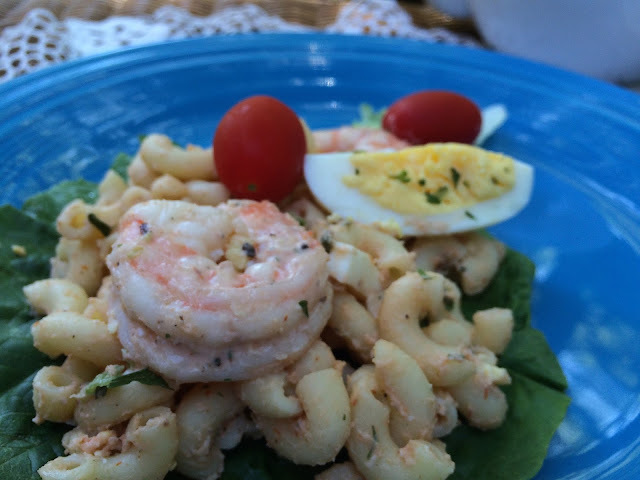 Today for tea on the patio, we are having this wonderful shrimp and pasta salad. With our 100 degree days here in Texas, something cool and refreshing is especially needed. I saw this delicious recipe last summer at Cathy's blog Wives With Knives. Somehow this Royal Vale takes me away to a cool summer cottage in England. A girl can certainly dream, can't she? For Cathy's original recipe, check it out here. I made half of Cathy's Shrimp Louie Dressing to try on the salad this summer. I loved this version, but both are so good, and if you love shrimp, I encourage you to try this! Mix all the ingredients together, saving 2 of the eggs for garnish. Mix the dressing ingredients together (below) and add to the bowl. Stir together and then garnish with the 2 additional eggs. Mix all the ingredients together and set aside. Add to the shrimp/pasta salad. I have the same teacup, Kitty! Don't you love how pretty china designs can inspire daydreams? Your shrimp and pasta salad is perfect for the hot summer weather. Love your teacup and the salad really looks good! It's real hot here these days too, sure would enjoy a nice breeze every now and then! Hi Kitty, wow I love this shrimp and macaroni recipe. Thanks for joining Cooking and Crafting with J & J this week. Happy Monday. It has been raining so much here that I would enjoy sitting on the patio in the heat as long as it was sunny! Your shrimp and pasta salad looks lovely. Thank you for sharing the recipe. This looks like a cool and refreshing salad to have on a hot Texas day. Your teacup is very pretty -- it's inspiring daydreams just like mine did today! Pretty tea cup, Kitty. We eat boiled shrimp at least once or twice a week added to some kind of salad. LOVE the teacup, Kitty! You know me and my love for pastoral/cottage scenes on china. So very charming! The pasta salad looks amazing and would suit me just fine on these warm days we're having. We spent the day on the beach and coming home to a cool pasta salad would have been very nice. Thank you, dear Kitty, for sharing with us and have a lovely week. Your salad sounds so good for summer and I love your Royal Vale teacup! I have a set of four with dessert plates and are perfect for summer! The salad looks tasty Kitty, I always love a pasta salad in summer, especially to take to the pot luck dinners. Your cottage teacup does lend to dreaming of a little place in the country doesn't it? Such a pretty tea cup Kitty. I believe I see a water fountain in the back ground, very nice. Your shrimp salad sounds good, although I do not eat shrimp that often. I think about it, but just never do. My, you are having some hot days! Why don't you take a little vacation and come here to the mountains? :-) Wouldn't that be fun! Hi sweet friend! Boy oh boy is it hot there! My aunt-in-law was just telling me that it's been hot where they are with no breeze. Speaking of my aunt-in-law....she and her husband live in Sachse, Texas and I just looked up the distance from their place to where you live and it said it's 26.6 miles away! If that is the case than maybe I can meet you sometime in person! Oh, wouldn't that be grand! We try and visit them every year or every other year and I was just saying to my husband that we should go out for Thanksgiving this year. Anyway, your salad looks delicious :) Thanks for sharing with Roses of Inspiration. Love to you! What a lovely recipe you have shared and it would be a great one for dinner too. I also took note of that beautiful cup and saucer. I fear it is going to take some getting used to for me to live where it is hot again. I believe in miracles though so that should help! Your salad looks so refreshing! I just made your zucchini bread with the cinnamon sugar topping. Oh my! I have to make it every year now. The Royal Vale cup and saucer is lovely. Yes a girl can certainly dream! I can't even IMAGINE 100º days, let alone, taking things outside to set up a tablescape & arrange food THEN taking photos! Whew-eee!! We're only in the high 70's all this week & I'm in HEAVEN!! It is a beautiful setting & the Royal Vale set is just beautiful. Love your water feature in the background, as well. This definitely looks like a great summer dish! Lovely and yummy looking tea! Wow dealing with 100 degree temps is tough! Trusting cooler weather will soon be on its way! Kitty, your shrimp salad looks so delicious! I am going to have to make this. I love anything "Louie"! Thank you for sharing with us. I love shrimp and this salad sounds absolutely delicious Kitty! The teacup is gorgeous and yes, it's fun to pretend that we are taken away. Wouldn't mind being in England! Thanks for sharing with SYC. I just love your teacup! The landscape ones are my favorite! My husband loves shrimp but not pasta...so will have to try it with rice. Thanks for linking to Tuesday Cuppa Tea! Yummy sweet lady, what a great recipe, looks great and easy. I'll make this for a Saturday lunch for hubby and me. Thanks tons for the recipe and for the wonderful visit. What a nice cold, delicious salad for the Texas Heat! Our air conditioning system went out and has to be replaced, yes in this heat. We took the dog and came to a nice cool place to stay until the repairs are made. Hope you stay cool this week its says 108 degrees! Hope you are having a great day and thanks so much for sharing this awesome post with Full Plate Thursday. Hi Kitty - Thank you so much for sharing my recipe. I'm very happy that you enjoyed it. It is a good recipe for hot summer days when we don't want to turn the oven on. Can you believe we are into August already. Where does the time go? Kitty, my dear mother would have loved this! Especially with a nice cup of tea in the garden! This shrimp and pasta salad looks delish!! Yum!!! I make a similar pasta salad, and mine calls for tuna. Most of the time, I leave out the tuna and serve this as a side dish at cookouts. I love it!